This focus on recruitment has been the goal of Lieutenant Darnell Davenport, who became Officer in Charge of the newly renamed Reserve and Youth Services Section this year. Lieutenant Davenport began his law enforcement career in the 1980s as a reserve officer himself, when the LAPD ran the combined/full-term classes — often a junior and senior class — each year. 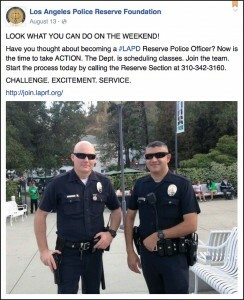 A Level III class started in September with 14 LAPD reserve recruits, and Lieutenant Davenport wants to ramp this up by at least 30 recruits in a class beginning mid- to late next year. The training may resemble the combined and full-term structure in the ’80s and ’90s, in which Level I and Level III candidates enter training together, and Level I recruits continue on to the next modules without having to wait for another class to be scheduled, as has been the case during the last decade with the implementation of the state-mandated module program. The plans are a major effort to reinvigorate the LAPD Reserve Corps and reverse its diminishing numbers. While the Los Angeles City Council originally authorized a force of 2,000 sworn reserve officers, the current count is less than 400. This is primarily the result of fewer reserve recruit Academy classes in recent years, coupled with ongoing retirements from the Corps. LAPRF President Karla Ahmanson arranged to get Shaquille O’Neal on board. Mr. O’Neal was with the Los Angeles Lakers from 1996 to 2004, during which the team won three NBA Championships. He also won an Olympic gold medal with the 1996 U.S. “Dream Team III” in Atlanta. Mr. O’Neal has a long history of supporting law enforcement. He has served as a reserve police officer in several agencies, including the Port of Los Angeles. In 2000, he reimbursed the City for the loss of an LAPD shop, one of two police cars burned by fans. (The Lakers organization paid for the other vehicle.) As The Rotator went to press, efforts were underway to have Shaq participate in several events to be announced, including a toy drive. Earlier this year, the “Look What You Can Do on the Weekend” campaign, which was used in the early 2000s, was dusted off and given a new, fresh face as a series of posts on the Foundation Facebook page. 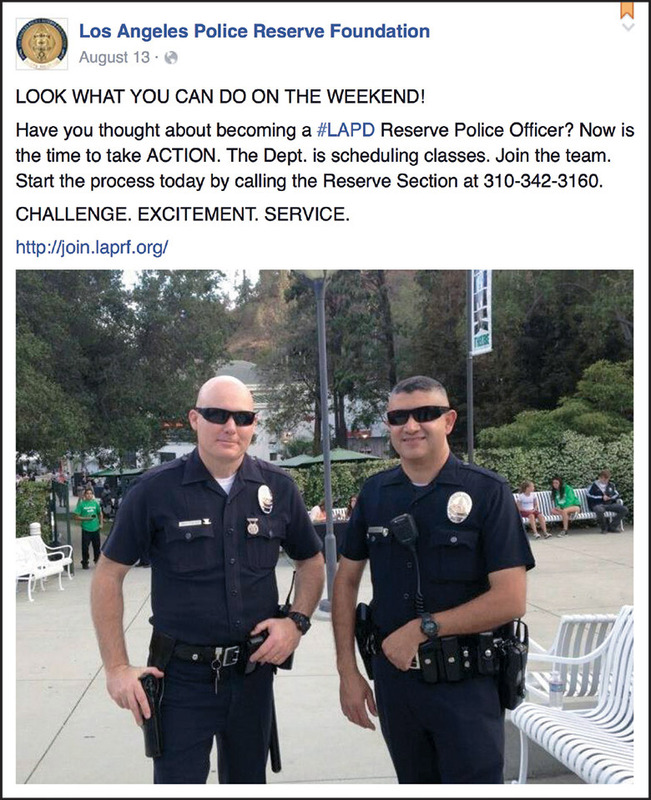 The posts, which feature pictures of LAPD reserve officers, encourage readers to contact the Reserve Section and begin the process of joining the team. The medium gives potential candidates the chance to ask questions, and allows the Department to get a better understanding of the FAQs. In addition, the LAPRF posted a high-quality video about the reserve program, produced by the Chief’s Office for Reserve Appreciation Month in April 2015. In the video, Chief Charlie Beck recounts that it was 40 years ago this November when he became a reserve officer. In the original posting, the video was watched more than 13,000 times. During that month, standees of Reserve Officers Tim Whitmann and Rebecca Doten were placed in the PAB lobby, signifying their dual careers. Pictures of these standees — as well as new standees featuring a couple of other officers — are now being used for the renewed recruitment campaign. A new 50-second video has also been produced by the Department to serve as a public service announcement for participating media outlets, including selected movie theaters. Other efforts include a digital billboard campaign, placement of recruitment banners on LAPD buildings throughout the city, and the updating of online recruitment pages and links.